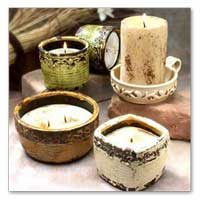 Save money and reuse your VINTAGE POTTERY containers by purchasing Candle Refill Wax. 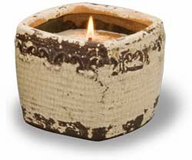 It's easy, fun, and great way to recycle candle containers. We do recommend that you only refill a container 3 to 4 times. The heat from the flame may weaken the pottery.It's so easy! Hot glue the wick in the bottom of the cleaned container, microwave the Candle Refill Wax, lid on, for 3 to 5 minutes. Pour and wait 24 hours. Filled with 9 oz. of American Soybean WaxTM. Measures 3.25"H x 3.75"W with a 45+ hour burn time. If you have any questions, on wick sizes, refilling or how to refill, please call us before ordering! Filled with 9 oz. of American Soybean WaxTM. 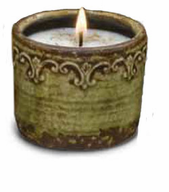 Measures 3.25"H x 3.75"W with a 45+ hour burn time.If you have any questions, on wick sizes, refilling or how to refill, please call us before ordering! Filled with 17 oz. of American Soybean WaxTM. Measures 3"H x 5.75"W with a 50+ hour burn time. 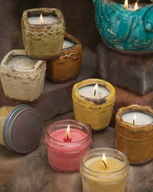 If you have any questions, on wick sizes, refilling or how to refill, please call us before ordering!